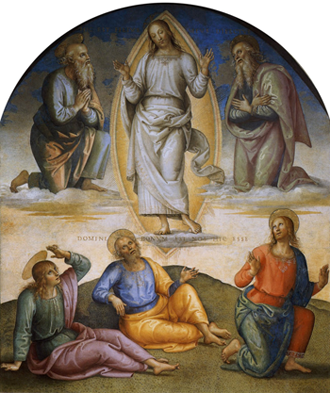 N BOTH THE ORDINARY and the Extraordinary form of the Liturgy, the Gospel about Jesus’ Transfiguration is read on this Sunday. This practice goes so far back in history that no one knows for sure when the practice started. We can only speculate as to the reasons why. The most likely reason would be very similar to the reason that Jesus had in showing Himself to his apostles in all his glory, or as he is going to appear to all of us in heaven. It certainly was to prepare them for what was soon to come in His passion and death. I don’t want to sound disrespectful, but with the exception of St. John it seems the other two apostles seemed to forget about this when the going got tough for Jesus. But as the famous quote from Pope Francis goes, “Who am I to judge?” We probably would have acted more like St. Peter and the other apostles during our Lord’s sufferings and death than we would have acted like St. John. I do think that today’s Gospel incident offers us a good opportunity for some catechesis on the notion of heaven. I hate to have to say it, but I fear many Catholics’ notion of heaven is a very negative thing. Extremely put, I once heard it said that few people would be interested in going to heaven if there were no hell! Maybe that is putting it too harshly and negatively, and if it be true in some cases, it is due to misinformation or poor instruction. Pope Francis and the Bishops are speaking of a need for a new Evangelization or a Re-evangelization. That big word simply means knowing our Catholic Faith. Authorities in the Church are waking up to the fact that for about the last fifty years the people have been poorly catechized or taught their Catholic religion. Unfortunately this happened even in Catholic schools where parents thought their children were being taught the Catholic Faith. It even affected some seminaries which produced poorly trained or educated priests. Fortunately this is beginning to turn around, but we have a long way to go before the situation is truly rectified. Pardon the expression, but some parents who ‘smelled a rat’ were the ones who rightfully assumed the education of their children by home-schooling. Some too refuge in some privately organized orthodox school. But I do think home-schooling was the most practical solution for most. So is it any wonder that people have little or no idea of what heaven is? And if that is the case, why work so hard to get there? I don’t deny the fact that it takes faith to believe in heaven; it takes faith to want to go to heaven. Our so-called old-fashioned, out-dated catechisms very wisely said that God made us to know Him, love Him and serve Him in this world, so that we might be happy with Him forever in heaven. It wasn’t an accident that the ‘know’ part came first. You can’t love or serve anyone unless you first know them. Our poor people today are missing out because of their poor catechesis in the basic knowing required. In heaven we will know and love God as He really is. But how can we want to love and serve Him in this world if we first don’t know about Him? Another aspect of heaven that people frequently wonder about is what I call the ‘societal’ nature of heaven. This refers to the fact that in heaven we will be reunited with our loved ones. I do believe this is an aspect that we can more readily understand. I especially look forward to meeting my sister and two brothers whom I never met because they died before I was born. Compared to our enjoying God, I’ll admit this will be minor, but it still can be a consideration. I mentioned before the need for faith to believe in heaven and therefore to really want to go to heaven. Unfortunately the world around us isn’t concerned about heaven, primarily because it doesn’t even know that much about heaven. I’m sure that God will take that into consideration in judging them. But people would actually be living not only a holier, but even a happier life even now if they lived in a way that they were always conscious that their true home and goal was heaven. I’ve witnessed this when privileged to visit a convent of cloistered Carmelite nuns. They have given their lives and themselves to Jesus and it seems that Jesus has already allowed them to share some of the joy of heaven. No heaven without the Cross: The Church has lived through turbulent times in the past and survived, and I’m sure the same thing will happen again. In the last fifty years, the Church has gone through some rather great difficulties. We are only now beginning to assess the damage. I can’t predict if the worst is over or if greater trials are still to come. But as Jesus told St. Paul: “My grace is sufficient for thee.” I don’t believe in suffering for things that have never happened. When they do happen, God will give the grace. The Liturgy in the Ordinary form presents God’s promise to Abraham to be a great nation. At that time Abraham had no children. But he did have great trust in God. We too need trust in God that in His mercy He will get us to heaven. In the Epistle for the Latin Mass St. Paul encourages the Christians not to be like the Gentiles who know not God. We may be sinners at times, but we do know God. And that is why so often in the liturgy we pray for God’s mercy. It is true that none of us will ever deserve to go to heaven, but hopefully out of God’s mercy, we will all go to heaven and be with God for all eternity.